T-Mobile has been partnering with the MLB for a while now, offering perks like free MLB At Bat subscriptions and an All-Star Game contest. As the new MLB season approaches, T-Mobile has announced that it’s once again an official MLB partner, and Magenta customers are going to benefit. Simple Choice customers on qualifying plans can get a free year subscription to MLB.TV Premium if the sign up for the service between April 3 and April 10. A subscription to MLB.TV Premium lets you watch every out-of-market regular season game as well as a free subscription to At Bat Premium, an Android and iOS app that offers features like home and away broadcasts and multi-game viewing. And because Major League Baseball is a Binge On partner, you can watch games on your phone or tablet without touching your high-speed data allotment. In addition to the free MLB.TV Premium for T-Mobile customers, T-Mo’s partnership with the MLB includes a sponsorship of the Home Run Derby and the Junior Home Run Derby. The latter is a nationwide competition that, with the help of youth organizations like Boys & Girls Clubs of America, will see kids competing in home run competitions for the chance to compete in a final home run derby during the MLB’s All-Star Week in July. 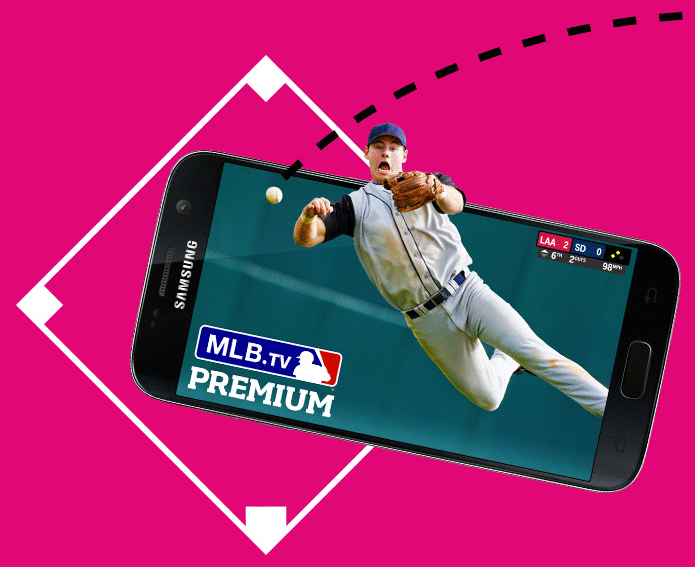 Because T-Mo has been partnering with the MLB for several years now, it’s not a huge surprise to see them teaming up with the MLB again and offering free MLB.TV Premium for the 2016 season. That doesn’t mean that this isn’t big news for baseball fans, though, especially since you can stream games without using your high-speed data thanks to Binge On. And with the T-Mobile and MLB partnership being extended for three years, it’s likely that baseball fans will get some perks for a couple of seasons following the 2016 year, too. I think you should emphasize how big this is in the headline. They’re actually offering the TV service for free, not just the radio service which had been what they’ve been doing in the past. agreed. in the past what they offered was a nice perk, but i wanted the streaming/premium subscription to watch on my computer, cell, etc., this is new and greatly improved and a HUGE freebie! As a T-Mobile Retail Store Manager, I can presume that you will need to be on a postpaid plan. Prepaid or No Credit Check accounts are most likely not going to qualify, however, everyone go check on April 3rd and let’s find out! Whoa, way to step it up T-Mo! That’s crazy. Free MLB TV. Wow this is awesome. I have been debating for the past month between single team or premium so I cancelled my auto-renew. It’s a shame though that many people have had their subscription auto-renew already and won’t get anything out of it now. Maybe that’s what they were thinking? Not true. Mine auto-renewed on 3/1 and I was able to call today and get it cancelled and get a full refund. This is phenomenal Tmo just put a buck ten in my pocket. Awesome. Signing up for MLB TV has to be done within those dates, or can it be done now through the app? Glad I waited before buying! I was getting ready to purchase at least a single team package so I can watch my Cubbies all season. Kennedy Kennedy Kennedy swing batter swing! This is truly a great offer, and loyal baseball fans know it. It was great just getting the At Bat app for free so I could listen to a few innings of Vin Scully after watching my Mets game but now being able to watch is even better. Even better is that the partnership with MLB has been extended another few years so we’ll have to see what’s next. and we just load the app while connected to cellular and got one free game each day or week or whatever ? They do this last year. I get to watch only one game per day and its game of the week thing. Not really worth it. But better than watching a blank screen. you are thinking of what they offered in the past, which was MLB.TV At- Bat. listen to broadcasts, see replays, watch game of week/day. this is not the same thing. that was worth maybe $20. This is MLB TV Premium. it’s the entire full package, all games, HD video, etc. massive perk. What is a “Qualifying Plan”? I have SC with the basic 2G of fast data. I think you have to have 3G or more to get BO. Is this the same as BO? I got the “old” MLB the last couple years w. the basic SC plan. With 2G speeds you won’t be streaming no baseball games. You barely can load a webpage. he is referring to the fact that he has 2gigs of high speed data and that 3gigs+ is required for “binge on” effects not counting against your data bucket. Yeah but he might have a a smart tv with high speed internet. Yes they are, but you can watch 90 minutes after the game ends…or change DNS on something like a Play Station. Still this is a really really good deal even if you have cable. Great deal by far and now I can watch my LA Dodgers kick some azz!! I hated that all I can do was listen to them on my cell phone. Let the baseball season talk smacking begin.. LEt’s Go dodgers!!!!! Where is the link for this? You can sign up on your cell phone or tablet at http://www.t-mobile.com/mlb.html. Note that you need to be on the T-Mo network. Make sure you’re on the network and not WiFi. I just tried it this morning, didn’t work. I’ll try later or tomorrow. Edit: make sure your GPS is on. Worked! I already paid for full premium.. . some BS right here. I had a buddy of mine who did the same and got a hold of MLB customer service and they refunded his money back. Give it your best it may work out for you. Doesn’t work for me either…….